The Ottobock C-Brace Orthotronic is a knee ankle foot orthosis (KAFO) that offers a better alternative to traditional locked out or stance control KAFOs. In some cases, it can provide the necessary support to allow those who were primarily dependent on a wheelchair to be able to stand and walk again. The Ottobock C-Brace Orthotronic leverages technology from Ottobock’s other prosthetics to provide natural flexion in all phases of gait. In MCOP’s clinical opinion, the advantages of the Ottobock C-Brace Orthotronic make it an ideal KAFO alternative for all appropriate candidates. The C-Brace Orthotronic Mobility System promotes a more natural gait pattern compared to locked KAFOs and traditional stance control KAFOs. The microprocessor in the C-Brace Orthotronic provides real-time control of the entire gait cycle, ensuring the highest level of safety while making movement easier and more stable, even on irregular terrain. For the first time, KAFO users can navigate ramps, curbs, stairs, and uneven terrain safely and without offloading all of the force onto the sound limb. Less force on your sound limb reduces the risk of lower back injury, osteoarthritis, and more. Wearers will also notice a significantly more natural stand-to-sit motion while using the device. The C-Brace Orthotronic helps wearers increase their stamina and mobility to expand the number of activities they can do. In addition, the C-Brace Orthotronic allows for more natural body posture, which helps strengthen and loosen muscles that previously may have been rarely used. Walk smoother, longer, and safer with the Ottobock C-Brace Orthotronic. The Ottobock C-Brace Orthotronic mobility system contains a microprocessor that allows the brace to adapt its resistance to any situation. In the event of a trip or stumble, the C-Brace Orthotronic will dynamically adjust the level of resistance to improve your ability to recover safely. The microprocessor also provides real-time gait analysis based on electronic sensors that relay information 50 times per second. Because the C-Brace analyzes gait in real time, the Orthotronic can predict and adjust for each step. Thus the C-Brace Mobility System allows wearers to walk and change speeds with less effort and concentration. 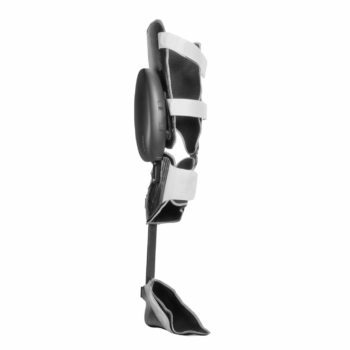 What conditions is the Ottobock C-Brace Orthotronic commonly used for? MCOP is Ottobock-certified and participating in clinical research on the efficacy of the Ottobock C-Brace. Getting fitted and approved for your Ottobock C-Brace involves 3-4 visits where your strength and range of motion are evaluated. Afterward, MCOP recommends attending regular PT until you are fully comfortable using the C-Brace in your daily life. Note that this device is not currently covered by Medicare and many private insurances. Please contact our billing specialists to see if you could be eligible.